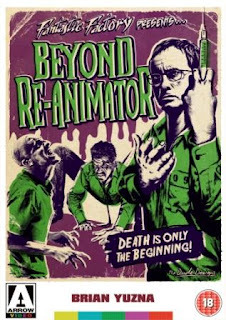 Surviving the collapse of the crypt he was cornered in by a horde of his reanimated corpses, Dr Hebert West continues to conduct his grisly experiments. He is eventually arrested and imprisoned but continues his research. When a young doctor named Howard Phillips begins work at the prison, he teams up with West to help bring his experiments to the next level. Hell breaks loose and copious blood is spilled however when several of the reanimated corpses break free and wreck havoc in the prison. Creative carnage grisly mutations ensue. Moments before he’s set to be burned alive on a pyre of kitties, an evil warlock (Julian Sands) uses the dark arts to transport himself from 1691 Boston to 1991 downtown LA, in order to escape the flames and track down the Satanic bible, which he hopes to use to bring about Armageddon. Fortunately, ‘Warlockfinder General’ Giles Redferne (Richard E Grant) is hot on his heels. They crash into the life of sassy chick Kassandra (Lori Singer) who is subsequently cursed to age 20 years a day until the warlock is apprehended. 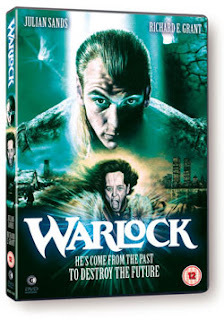 While immensely trashy, Warlock also takes itself very seriously, which is probably its saving grace. A number of striking ideas pepper the schlock, and it's interesting to see how writer DT Twohy mingles medieval superstition with more contemporary ‘old wives tales’ and practices, and a healthy dose of Eighties sass. The arrival in Vienna of international diplomat Neil Wardh and his wife Julie, coincides with a spate of vicious murders. In her husband’s increasing absence, Julie finds herself the (mainly) unwilling recipient of attention from her sadomasochistic ex, Jean and her latest suitor, George. As the killer continues to wreck havoc, and Julie's affair with George becomes more torrid, it becomes apparent that the victims are all connected to her and she begins to suspect each of the men in her life of being the sadistic maniac… Can she work out who it is before it’s too late? 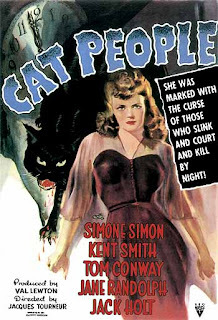 The first film in a series of moody, literate horror films produced by Val Lewton in the 1940s, Cat People is an evocative example of how effective the ‘less is more’ approach to horror can be. Directed with effective restraint by Jacques Tourneur, the film is a masterpiece of mood and atmosphere. Choosing to suggest the horror rather than show it outright, Cat People remains a beautifully eerie and atmospheric chiller to this day. One of the first films to reference the work of Sigmund Freud, it plays out as a dark and unflinching study of sexual repression and anxiety. 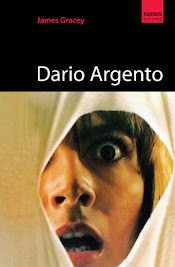 Head over to the Classic Horror Campaign to read my full review. Keep up to date with the Classic Horror Campaign on Facebook and sign their petition to return classic horror double bills to BBC scheduling. Classic Horror Campaign Presents: A Horror Double Bill! 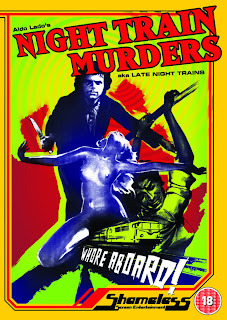 The lovely folks behind the Classic Horror Campaign have just announced the launch of a series of horror double bills! The first event takes place this Easter on Good Friday, at the Roxy Bar & Screen in London. 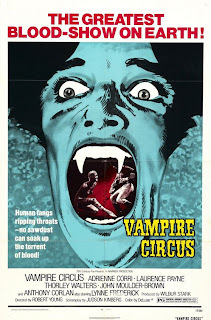 Starting at 3pm on April 22nd and in the old tradition of the BBC Horror Double Bills, there will be a double bill screening of Night of the Demon (1957) followed by Hammer’s classic Vampire Circus (1972). As well as the movie screenings there will be some horror DVD giveaways and the opportunity of appearing on the Classic Horror Campaign website when they post coverage of the event. Tickets are £5 and are available on the door. Seating is limited, so it’s recommended that you get there early. Paul Naschy (born Jacinto Molina Alvarez) is a cult icon and one of the most significant figures in the history of Spanish Horror cinema. 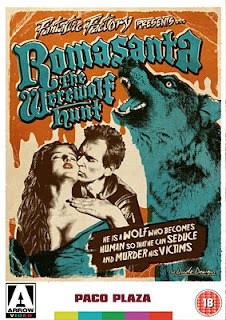 He is best known for his twelve “Hombre Lobo” movies, a collection of unrelated stories that all feature the character of tragic werewolf, Waldemar Daninsky (played by Naschy himself). 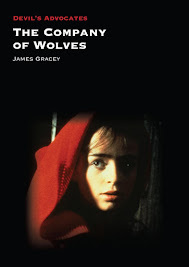 The Werewolf and The Yeti AKA Night of the Howling Beast AKA Curse of the Beast AKA Hall of the Mountain King, is the eighth in the series, and was directed by Spanish exploitation devotee, Miguel Iglesias, under the alias M.I. Bonns. 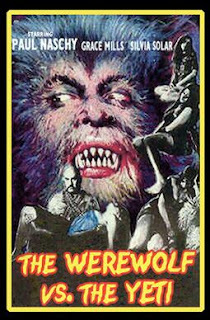 Made at a time when Spanish horror films were starting to fade out of popularity after their ‘Golden Age’ in the early Seventies, The Werewolf And The Yeti would be the last Daninsky picture for several years, until Naschy returned in 1980 with El Retorno del Hombre Lobo/Return of the Wolf Man; one of his own personal favourite films.